Before the hate comments start pouring in, one of my guests today, C.S. Splitter(who wrote this post) is in fact a man!! So if he wishes to gender bash then he may!! LOL!! Take it away Splitter!! How many times have you heard that? The thing is...it is often true. We all have our moments. Sometimes, however, being an idiot pays off. It did for me, at least. I am the analytical sort. I look at numbers and try to see patterns. I research topics to draw conclusions. This is especially true when it comes to business and writing IS a business. But I did not do those things before I wrote “The Reluctant.” I just got some inspiration and tried to write a good story. Had I done a little research, I would have realized that women rule the fiction market making up about 80% of the audience. If I had known that beforehand, I would have written a different book. I would have written a different series. I would have catered to what I thought women wanted in their reading. Err....all I am saying is that had I done my research, the numbers might have led me to those conclusions. I didn't say they would have been right. In my ignorance, I took my main character one step further: I made him a bit of a pig. He doesn't mean to be a pig, he just can't help himself sometimes. He draws wrong conclusions, let's his libido do his thinking at times, and is generally a fellow idiot. So, I wrote a book with a male lead who has few traditional leading man characteristics AND I made him in such a way that 80% of the audience would have a hard time liking him. I told you I was an idiot. They, whoever “they” are, say that numbers do not lie. I disagree. Numbers would not show just how diverse women's tastes in books really are. Numbers would not support having a “regular guy” as a main character. Do women read action/adventure? You bet. Ignorance is bliss. Ignorance run wild is idiocy. I was wildly ignorant and, now, I am glad about it. 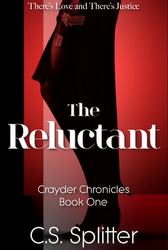 “The Reluctant,” the first book in the series, went nuts on the Amazon charts in January. 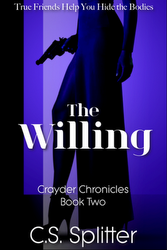 Book two, “The Willing,” just came out in eBook form in November. Both of them have just been released on Amazon in print. Did I mention that I have made “The Reluctant” free? Well, it is. Just follow the links below. Plus, we are giving away “The Willing” as an eBook today! If you didn't win “The Willing,” I am also offering a promo price for the blog tour at Amazon. Free + $.99...I told you I was an idiot. Sounds great right? Well tune in for the blog hop where this book is up for grabs!!!! I've read both of Splitter's books & thoroughly enjoyed them!! And that opinion comes from an average 77 year old female fishducky!!! I find that pretty funny that you would have written a different story/series had you known women ruled the book world. Though it seems good thing you didn't know as it seems you have written a great story with a very real character in Tom. Sounds like a good read!